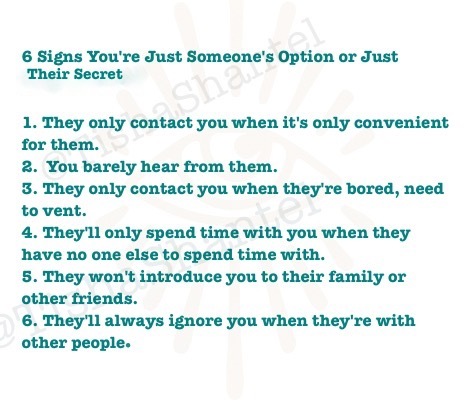 6 Signs You’re Just Someone’s Option or Just Their Secret. This entry was posted in Friendship Topic, How real are they?, Learning To Love Yourself, Relationship/Love, Relationships and tagged 6 Signs You're Just Someones Option or Just They're Secret, fake friends, Friendship, Love 💜, Option, relationship, Relationship signs, Secret relationship, Signs, Signs Youre An Option. Bookmark the permalink. ← What do people say when you tell them you’re a #blogger?